In these works, I explore the rich seasonal changes of plants in Virginia over a year. I painted in monochromatic sepia tones (Schmincke sepia brown) to emphasize the structure of each specimen. I was inspired by the compositions of the illustrated plates of Ernst Haeckel (1834-1919), a German naturalist, physician, biologist, and philospher. The strong graphic organization and symmetries create fascinating relationships amongst the specimens. These subjects are common botanical species found within 50 miles of my home in Charlottesville, Virginia. 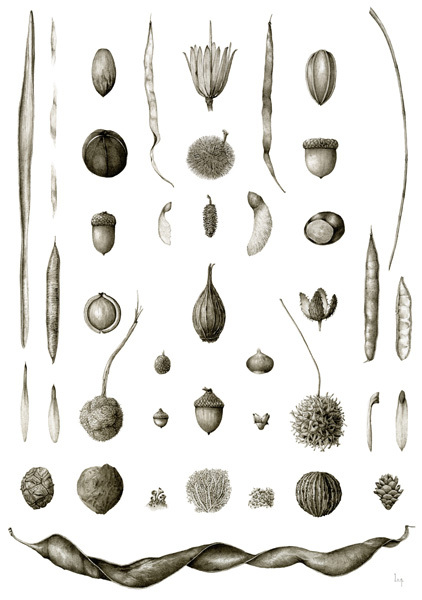 Plant nomenclature is based upon the publication of The Flora of Virginia (Weakley et al. 2012). This collection of 12 paintings (watercolor on paper, 12 x 16 inches) was awarded a Gold medal at the RHS Botanical Art show July 11-12, 2018. Limited edition signed giclee prints of each of these can be purchased in my online shop and the full original collection is available for purchase. Contact Lara for pricing.